At Johnson Controls, we help keep your building operating at peak efficiency with our ECOSS Stainless Steel Condenser. At Johnson Controls, we help keep your building operating at peak efficiency with our ECOSS Stainless Steel Condenser. We’ve built this stainless steel condenser to withstand the tests of time and offer longer-lasting performance in the harshest environments. 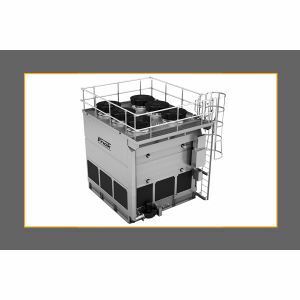 Featuring a self-passivating stainless steel coil, frame, covers, and basin design that has been proven in the most remote locations where water quality is often an issue, this stainless steel condenser from Frick® significantly reduces annual operating costs and provides a life span double that of conventional evaporative condensers. Self-passivating 304L stainless steel coil, frame, covers and basin. Easier installation with less weight than galvanized steel. ASHRAE 64 Certified facility; with ASME Certified serpentine coils. Easy access to components for reduced maintenance hours & costs. Exceptional resistance to white rust and corrosive elements. Highly efficient direct-drive fan options lower energy consumption, increase reliability. Effective life span doubles that of conventional evaporative condensers. Watertight, UV and corrosion resistant inlet louvers minimize biological growth. Specially designed basin reduces water usage with higher cycles of concentration. Less chemicals required (zero zinc or lead in discharge of blowdown). Significantly reduced annual operating costs and up to 70% savings in total life-cycle costs. More than 45 unit variants available.